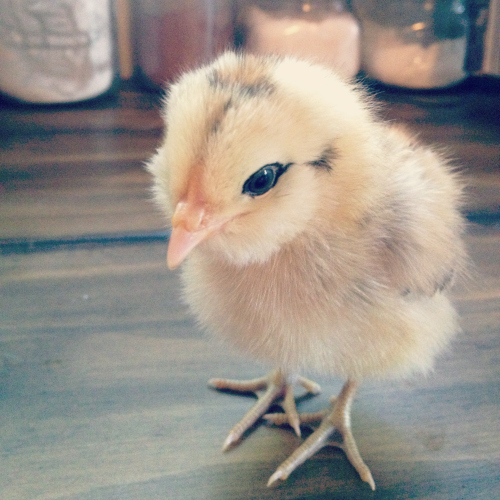 Nothing much cuter than a fuzzy baby chick! We've been planning to get chickens since moving into the cottage last summer. Our original plan was to adopt a few grown hens from my parents, but recently someone (ahem, my mother) suggested we really needed baby chicks for Everyn. She pointed out how they'd become more like pets if they grew up being handled a lot. Of course there's no way around endless cuddling with a curious, animal-loving toddler who already happens to be a pro at the sport of chicken-watching. The biggest selling point was when I realized how many hours of indoor entertainment they'd provide. Sold! Off to the hardware store we went. Pepper is a breed called Dominique. 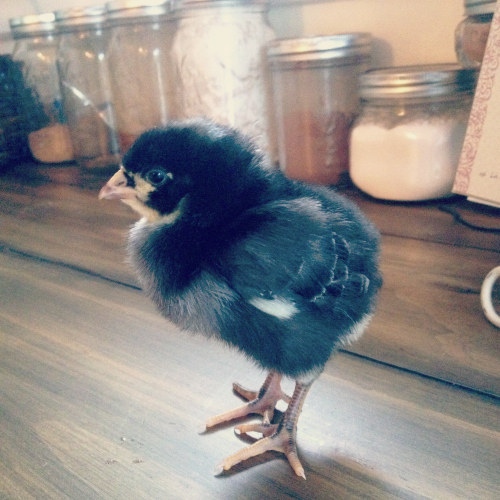 She'll grow into a stunning black and white stripped hen in a few months. How cute is she?? Ruby is a Rhode Island Red. Think classic little red hen. She tends to be the favorite so far thanks to her friendly nature. Ginger is a Gold Sexlink. 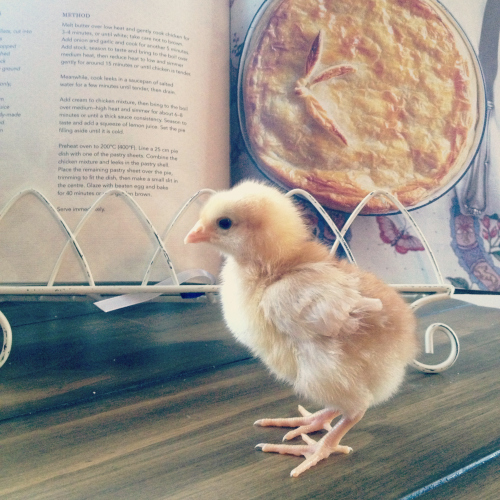 She'll be a lovely golden hen when she's all grown up. She's an Americana. A real looker with her natural eyeliner and fluffy cheeks! Americanas can turn out lots of different ways, but we think she'll be a lovely silvery grey. She's also what they call an 'easter egger' because she'll lay beautiful light blue or green eggs. Agnes is a Gold Laced Wyandotte. All grown up she'll be a gorgeous black and orange-y gold color, with a stunning scalloped pattern all over. They're living in a bin in our kitchen right now, until they're old enough to fend for themselves outside. (and the construction of their new coop is completed--it's so darling) I grew up with chickens all my life, but I forgot how fun they can be when you humanize them and make them pets. Great example: They'll actually start 'screaming' when too much time passes and they haven't heard our voices. It's an incredibly loud, frantic peeping we can hear all the way upstairs that would make you think something was trying to eat them! So funny. Every once in a while we actually have to go down and calm them. But my favorite is when they go to sleep. They don't roost yet the way you imagine chickens sleeping, the just sort of melt into fuzzy feathery little puddles scattered around their bin. Sometimes they use each other as pillows. It's hilarious. Just not they way you imagine chickens behaving.